Technically speaking, computer and biological viruses are affiliated to two unbridgeable and well-separated spheres, one prevalently pertaining to the domain of information and the other to the one of carbon-based life. Their material formation contributes to such divergence: while computer viruses are normally fabricated by and partially depending on human agency, biological viruses are mostly understood as naturally occurring. Worms, Trojan horses and computer malware are often described as if they were a digital version of the natural ecosystem. However, a real intertwining and merging with such system is still confined to the domain of science fiction. The two realms do not speak to each other. While the first only understands the lingo proper of information technologies, the second takes in the language of the biological. Communicating by means of binary code, computer viruses are a separate category. Their circulation within the world of digital circuits, and electronic networks, makes them unquestionably distinct from their biological counterparts. There seems to be no real intersection between the two categories. Despite the factual and easily discernible discrepancies between computer and biological viruses, the first are affiliated with the latter, to the extent that, in most cases, their existences appear intimately entangled. One element seems to confirm this kinship: their invisibility. With their submicroscopic size, biological viruses constitute some of the smallest biological agents known. This makes them inscrutable to the human eye. Strolling the Internet and hiding in the most recondite folds of our computers, computer viruses are mainly made of code. The user needs a considerable amount of technical skills to detect them. Once disassembled, they provide nothing to the user's sight. Western culture is dominated by the philosophical principle that “seeing” is necessary to “knowing.” “The scientific notions of ‘objectivity (Van Loon 2005, 112),’" Van Loon observes, "has always (or at least since Plato) been ordained by the principle of visibility." If, in order to be credible and properly analyzed, the object must be observable (109), then, viruses remain unknown and pervaded by an overall sense of indeterminacy. The lack of visibility, as instance of the unknown, is a considerable source of fear and anxiety. In the case of viruses, this factor adds to their already infamous popularity as mainly dangerous (or evil) agents. This invisibility is not just source of fear. At the opposite end of the spectrum, it nurtures a desire to overcome the indeterminacy that pervades viruses, generating a continuous drive to further explore their behavior and composition. As reaction to the anxiety produced by viruses or, on the contrary, as the product of a drive to domesticate them, stand many attempts to describe and represent these agents, and to create tools to manage such invisibility. Using a number of technological devices, from invisible, formless substances, viruses can be turned into visible objects. Knowledge acquired through this objectification has a double function: it leads not only to understand but also to eventually neutralize the anxiety engendered by these substances. This has implications in the display of the final picture. In fact, technologies intervene to clarify, specify and objectify. At the same time, they act as a protective layer between the scientist and the "object", the user and the code. Various devices (electron microscopy, customized data retrieval software or 3D modeling) are juxtaposed to assign an appearance to viruses by associating the energetic signals they emit or the numbers and algorithms they are made of, to a specific color, shape, behavior. Paradoxically, the very technologies that should reveal, by displaying viruses (thus contributing to eliminate the fear they cause) end up making them disappear under multiple layers of technology and interpretations. A product of this trend, visualizations of computer and biological viruses reach a stage in which their “imagined” metaphorical affinity becomes a “material” affinity, as the two increasingly approximate each other. Visual representation challenges the domain of the unknown. At the same time, it protects from the obscure domain of the unknown. Pictures, maps and models constitute different ways of making the invisible visible, to order the indeterminacy of chaos and to “neutralize and contain what provoked anxiety and distress (Bauman 2005, 20)” in the first place. Companies and research units involved in the field of visualization describe their own activity as “the final frontier (In-Vsee 2008; Coy 1996) .” According to this notion, Virilio illustrates, the unknown is a continuously shifting horizon to be conquered and turned into the known. To do this, risky explorations have been undertaken to push the border of the unknown further away, and increasingly sophisticated technologies (microscopes and telescopes) have been devised to conquer the infinitely small and the extremely far away (Virilio 2000, 54). No doubt, viruses represent a challenge to explore, or to move the boundaries that delimit such frontier. Using better tools able to ‘see’ viruses, to enhance the understanding of these submicroscopic and ephemeral agents, it is implied, would ultimately liberate us from the looming anxieties they are able to generate. ..The common reaction to the unknown is fear and panic…. Thus, conquering the mystery of viruses is not the same as simply gathering information. It unfolds as a defensive gesture, as if knowing meant to single-out and to de-limit the object of inquiry within a visual and material space, with the purpose of minimizing its damaging potential and taking distance from it. …To understand something is called ‘seeing it.’ We try to make our ideas ‘clear’, to bring them into ‘focus’ to ‘arrange’ our thoughts. The ubiquity of visual metaphors in describing cognitive processes hints at a nexus of relationship between what we see and what we think (1). While seeing means to uncover, to explore and to understand the unknown, it is also a strategy to neutralize it. The inability to see is disorienting. “Peur toujours, peur partout (Bauman, 2005, 2).” With these words, Bauman recalls Febvre’s description of “the experience of living in the XVI century Europe,” when ubiquitous fear was evoked by darkness, “..which started just on the other side of the hut door and wrapped the world beyond the farm fence…(2).” Darkness does not necessarily stand for any threat. However, it is the natural locus of uncertainty and mystery, or the place where anything could happen (4). “Images and image technologies are involved in the way we know, experience, feel about and respond to the world”(5). In a sense, there is an affinity between modern utopias and the new frontier: “insofar as real spaces elsewhere have been exhausted, it is necessary to find new kinds of place and frontier that sustain the needs of the modern imaginary (15).” Whether through the implementation of technologies or through plain research, with its current richness, and productivity, the industry involved in assigning a visual appearance to viruses embraces the above notion of knowledge. Viewing, visualizing and materializing the unknown summarizes both the curiosity in imagining it as well as the anxiety it engenders (Robins 1999, 58). Seeing becomes an act of re-presenting as well as a defense strategy against the demon of the unknown. Visualization methods and technologies are called upon as a protective screen that transcends and separates humankind from the fearful chaos of the world, by making every object visible, yet maintaining it substantially virtual and at a safe distance. While every picture produced is a way to unveil yet another facet of viruses, it incorporates the anxiety and the fear of the unknown that has characterized the drive to portray and picture viruses in the first place. Commenting on the visual materialization extracted from data and specific information, McCormick et al. (1987) observe how these images "transform the symbolic into the geometric." In fact, the challenge of information visualization, Chen confirms, is to “come up with a design metaphor that will accommodate the transformations from non-spatial, non-numerical concepts to something visible and meaningful” and will make sure that the “particular metaphor does, indeed, work (Chen 2005, 29)." Thus, visual representations constitute a rationalization of the object. A way to unravel the unknown, visualization isolates something immaterial, it extracts its crucial information, it processes such information and turns it into a concrete—almost tangible—object. Technology-mediated vision, we are reminded, excludes the contact with its reality (Robins 1999). This attitude is neither unlike the one proposed by modernist planners and architects, nor is it radically different from the objectives that lie behind today’s ubiquitous surveillance cameras. Modernist architecture “sought to erase what we may call the city of touch, and in its place to construct the glass city (19).” Its fundamental objective was “that of transparency,” aspiring to the idea of universal panopticism, through which it seems possible to “achieve order, and consequently master, the urban space (20)." Like the glass window separating the observer from the observed, thanks to the process of visualization, viruses are never experienced directly, but through a number of filters and layered operations. Thus, they are separated from their observers. On the one hand, these filters increasingly adjust the focus and define the contours of the virus as object. On the other hand, they mislead and increasingly distance the viewer from the object. Both technologies and methods employed support a notion of knowledge that privileges the act of “seeing from a safe distance” suggested by Robins. The tendency to separate the observer from the observed is proper of the “in vitro” and "forensic" approach." To be turned into a self-contained object, viruses are displaced from their original location, frozen into a particular position. The substance is moved into a controlled environment, such as the lab, or the test tube, and is turned into a self-contained object. This allows the study of the object of inquiry from a safe distance (Latour 1983; Stafford 2002). A forensic analysis intervenes to reconstruct and simulate the behavior, and the damage caused by viruses, by inspecting and comparing the condition of the host in relation to the virus before and after the infection has occurred. While both approaches delineate and define the substance in its general features, they also submit it to a process of transformation that ends up distancing the so-called object from its previous embodied state. Through different methods and technological instruments, disciplines that study both biological and computer viruses appear to embrace identical approaches. The practice of separating viruses from their initial milieu  is common in microbiology and virology, when the material that contains the viral substance is transferred from its originally observed location into the laboratory, and it is analyzed inside the Petri dish (to observe its growth) or on a slide. The methodological processes gradually transform the virus. 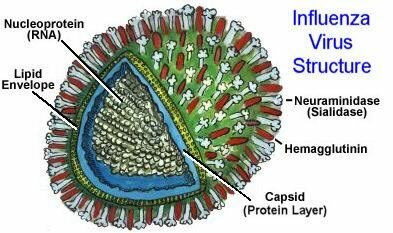 For instance, although the virus’ survival depends on the host and on the surroundings' conditions, its visual representation portrays it as an isolated entity, or as a virion. In this visual form, this object stands for the virus, although it does only epitomize one of its facets. A similar in-vitro method characterizes the study of computer viruses. Despite becoming active only when they are launched inside an existing computer environment (the host computer), and when they are triggered by an external event (such as the opening of an attachment), no visual representation of viruses shows their relationship with, and even their crucial dependence on such events. 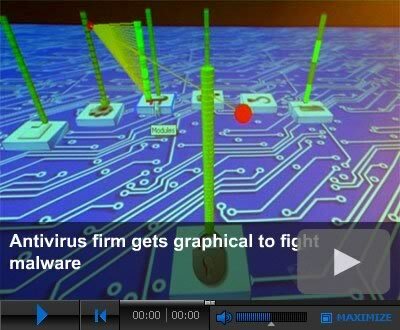 Even when sophisticated animations are used to show how malware operates and moves to attach itself to the host computer, they usually portray one single virus unfolding against a black background, as if it was surrounded by a void environment, or the virus were located on a slide ready to be scrutinized through a virtual microscope . A recent example of the in-vitro approach can be found in the use of honeypot computing. Honeypots are computers or internal networks built to look like any computer system. However, they are specifically devoted to capturing and trapping malware. This strategy, claim computer analysts and researchers, is used to allow the study of malware and to expedite the dissemination of new anti-virus solutions (Galloway & Thacker 2007, 104; Kaspersky 2006). The idea behind the honeypot is to create a safe environment for experimentation, analogous to the safe environment of the lab. Once trapped inside, viruses have no way to expand and infect other computers. Inside this virtual environment, the computer virus can be analyzed and simulations (visual or not) of its transformation and spread devised. While the above method facilitates ad hoc studies to determine the effect of a specific virus upon a virtual environment, it also, and inevitably, separates it from the rest of its environment, the World Wide Web. Visual representations of the behavioral patterns of viruses are based on the above premises. Admittedly drawn from the popular TV series, FSCSI (F-Secure Crime Scene Investigation), consists in simulation via animated sequence of how viruses infect data on the hard drive. ..[FSCSI] records data before and after the [viral] sample is run and then compares the two for changes: the intermediate stage, that is, the process that has led to the infection is, then, guessed, based on the evidence provided by the previous two states (Sean, 2007, F-secure weblog, comment posted July 5). The object portrayed is basically un-representable by means of traditional tools. Thus, reflecting the assumed scientific paradigms and notion of knowledge illustrated above, the technologies employed in the examination of viruses have a tendency to go unnoticed. Both in-vitro and forensic methods extract and focus specifically on the object-virus. The process(es) leading to the objectification certainly contribute to the specification and sharpening of the object. Observing the resulting image or the animation, Trumbo asserts (2006), even the most attentive audience will have difficulties to tell whether an image published on a science magazine "faithfully" represents the object, or is it just a colorful or science fictional rendition. In fact, technologies of visualization are perceived as “transparent, neutral intermediaries between the scientist and nature (Pasveer, 2006, 43)." “Mechanical” objectivity projected by the instrument substitutes “the machine for the human sensory apparatus (42)." With their magnifying, and enhancing capabilities, the microscope, the screen, and the software are believed to stand for and substitute the eye. However, technological devices are anywhere transparent. They abstract the object, filter it, prepare it for observation. By standing between the object examined and the eye, they act like a filter that facilitates the vision by selecting and extracting information emitted by the object of study. If Van Loon argues, technoscience is driven by a desire for the “colonization of the unknown,” it can only do so by “creating another remainder: this remainder is none other than an index, which defies visualization (Van Loon 2002, 108)." The technologies used are responsible for confirming such reminder, by simultaneously revealing, while objectifying the virus, and building a distance between the object and the viewer, thus, gradually withdrawing from such object. By continuously iterating the idea of knowledge as both boundary-crossing and boundary-building, these technologies simultaneously reflect and reinforce the anxieties and the curiosity engendered by viruses. …Despite the value of the EM’s (Electronic Microscope) high resolving power, the energy needed to attain short wavelengths poses a problem. High-speed (short-wavelength) electrons are quite penetrating, and most biological subjects are transparent to them. Thus, in order to visualize viruses, they are generally either stained or coated with a heavy metal such as platinum or osmium. …The particles then are visualized by passing electrons through the specimen and observing it on a fluorescent screen (Wagner 2006, 120). By projecting a focused beam of electrons onto a specimen, the electron microscope returns surface information about various features of the virus, such as its morphology and molecular structure (Lynch 2005). The conception and production of an iconic visualization implies that the final image, to be appropriately viewed, has gone through some degree of manipulation. During this process, the virus is turned into a “virtual object” that has already passed through a number of phases before reaching its current visible status (the substance has been stained or coated in another substance, and information about its shape has been generated as a reflection, thanks to the bouncing off of electrons on the surface of the virus) (Wagner 2006). The snapshots produced by the electron microscope are usually black and white. It is not uncommon to find an identical image displayed in different colors. Coloring is an additional technique applied to further specify and "bring up" further details in the structure of a viral agent. Subsequent technological devices are, then, deployed to process and select the initial data provided by the microscope. 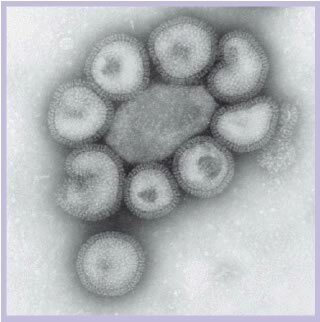 Following this procedure, basic images of a common type A flu virus  may be colored and focused to highlight a particular detail or to distinguish the parts that compose the “body” of the substance. Obtained by freezing the object at cryogenic temperatures, data can be retrieved through EM electron microscopes and additionally processed with one or, more, custom software that gather, separate by typology (molecular composition, genomics, structure) and then, display, three dimensional imaging data of the molecular structure and other properties of viruses. The resulting image reminds us of the previous snapshot. However, the amount of details and information the picture is able to provide are countless. The need to provide detailed images of the structure and composition of the A virus appears to be directly correlated to its transformation into an increasingly geometric-looking object. On the one hand, these increasingly geometric images respond to and satisfy the need of clarity required by the specialized discipline and purposes they have been generated for. On the other hand, this geometric transformation dissociates and strips the virus-turned-object of any expected nature-looking element that connects it to the biological realm. The above picture becomes a model that stands for all A-virus objects. This process confirms that technologies of visualization are, indeed, technologies of display (Van Loon 2002). In fact, they are geared towards assigning a—possibly clear and, more importantly, well recognizable—visual profile to viruses, by running the “object-virus” through a process of increasing rationalization. Simultaneously, they are technologies of disappearance as they turn the unknown category of infectious agents into something that is eventually more “obscure,” and that has lost any naturalistic look. In fact, as the exploration of viruses pushes the boundaries of research towards portraying smaller and more accurate scales, employing even a vaster range of technological devices to collect and process data, the viral object is enriched with newer details and can be analyzed with increasing accuracy. At the same time, the object drifts farther away, taking appearances that resemble less a natural organism and more a computer generated or an artificially processed entity. It should not come as a surprise to see images such as the one below, in which the colored snapshot of the type A virus displayed in the previous pictures magically appears on a computer screen to signal the presence of a computer virus or to indicate an infected computer. 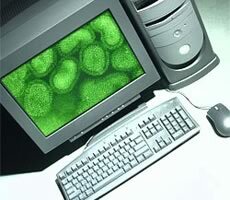 In this case, the appearance of a computer virus is directly borrowed from the visual vocabulary of microbiology. Why not make such analogy, when both the methodological process (with its increasing rationalization), and the technologies used (with their direction towards geometry), encourage such analogy? Since the visual representation of biological viruses tends towards an increasing informatization, it might be used to represent computer viruses as well. Biological and computer viruses already share a few elements: the above image goes a step further and exploits this resemblance. This, in turn, acknowledges the phenomenon that sees technological devices increasingly realizing, through visual representation, the assimilation of the two. "...Represent a phenomenon that is observed in a historical and physical reality (thus implying iconical and indexical reality), but equally may include those ideographic activities that seek primarily to express ideas or relations and they have no material referent whatsoever (a combination of mimetic and expressive elements) (Pawuels 2006, 5)." When representing informational entities such as computer viruses, the existence of the referent (the virus constituted of a string of digital information) appears to be only postulated. Viruses are “enpresented,” that is, they are made insightful, present (Van Loon 2002, 115). “Enpresenting,” already practiced in the visual representation of biological viruses, is relevant to describe the process that leads to the representation of computer viruses. “In many cases” Trumbo argues, “ scientific information is theoretical or conceptual with no obvious physical form, so technology, symbolic representation, and creative expression are employed to craft a visible interpretation” (Trumbo 2006, 267). The absence of an “obvious physical form” automatically opens to an almost infinite number of interpretations. This is particularly true in the case of computer viruses, whose structure and configuration are not directly tied to any physical form, unless this physical form is extrapolated and rendered by using other types of viruses, usually of the biological variety, as their designated model. In turn, the physical form biological viruses are mostly associated with is the fruit of a convergence of interpretations, conjectures and assumptions on what their form might –or should—looks. The visual representation of computer viruses is product of the above conjectures, having to reach for already available images. A comparison occurs between the malware that ought to be graphically visualized and the scientific visualization of biological viruses and the latter automatically become the models to be adopted, and adapted to provide the most credible visual appearance. In fact, in the earlier example, the biological virus was simply "dropped" onto a computer screen. The biological model is used when malware is processed and translated to generate visuals of computer viruses. Attempts to visualize computer viruses and worms exploit the tendency of scientific visualization to partition off their object of study into an increasingly geometric assemblage, embracing geometric shapes as indicators of their informational nature. The virtual objects, in this case, emerge from both technological translations and cultural models that suggest how computer viruses should look. "Okay, I hear a lot about these computer viruses but what do they actually look like?" - goes one of the most frequently asked questions we get. We have been working on some visualizations projects trying to answer that (Gergo 2005, F-secure weblog, comment posted September 23)"
Viral code had to go through at least three phases that would first enable the researchers to analyze data, help them select and classify these data according to a series of criteria established by the researchers themselves, and, finally, would turn data collected into graphic elements. The team of analysts responsible for this enterprise had to decompress and disassemble the malware using a debugging software (IDA Pro) ; the resulting data had to be prepared to be exported by using a specially designed plug-in (IDA Python plug-in) ; the prepared material had to be formatted again, through Pydot "..an interface for creating graphs from Python. " Finally, the processed code could be uploaded onto the graph visualization software called “GraphViz” that would turn the data into the above two-dimensional visual map. 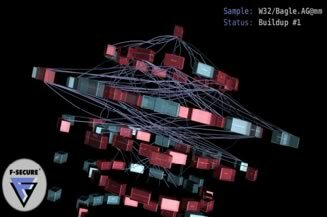 The team of researchers recognized that to gain more insights in the structure and the dynamic functioning of the malware, the data had to be turned into an animation. This would enable to visualize and follow the various stages of the malware infection, including what would trigger the code to call each function and how the execution of the code would unfold. In this second attempt, using the same data extracted and processed through the same debugging program IDA Pro, the analysts utilized a different plug-in to format the data and make them suitable for processing them with a 3D software. A special IDA plug-in programmed using Python was employed to prepare the data to be uploaded onto the content creation software Blender,  so that an animation could be generated. Visualized using this particular method, the virus unfolds through the web of relations formed by its active functions. Displayed in the format of an animation, it shows the progression of a potential viral attack. According to Axelsson, this particular display of data has utilitarian purposes. In fact, it solves a key problem with current intrusion detection systems. With the high amount of daily intrusions, typical network security systems have the tendency to produce many false alarms. Applying information visualization to intrusion detection facilitates the task of the analyst to record the progress of viral attacks, and to identify weaknesses within specific parts of the system (Axelsson 2007, 80). The function of the above visual representations and animations to improve the effectiveness of intrusion detection reflects the double drive that dominates visualization: improving knowledge by making the object visible. The object visualized becomes more accessible and manageable. The layers of technologies utilized separate the object from the user, allowing him/her to observe it from a privileged, safe location. In the construction of the above animations, lacking any real reference, the representation of the computer virus tends to use a biological model as its reference. Although the similarity between these biological and computer of viruses is somehow assumed, in these examples there is also a clear attempt at underscoring their differences. The use of rectangular shapes (as opposed to spherical elements) in the representation of computer viruses reclaim their visual separation from their biological kins and reflected the urge to establish an iconographic precedent in computer virus visualization. However, this new visual paradigm had to take into consideration some existing cultural conventions. In order to be recognizable, the computer virus had to contain elements that would reestablish a connection to its biological peers: the allocation of the functions to form a spherical, "virus-reminiscent" form catered to this need. Thus, driven by the need to assign a visual appearance to a particular type of agent that consists of code, this visualization had to draw inspiration from the domain of the biological. The resulting object is more approachable, as it now reveals its functions and active components. At the same time, it becomes more distant, as the code that initially composed it tends to disappear under layers of processing and visual elements. Interestingly, the two examples reveal how visual representations constitute important added aesthetic moments. …despite a surface appearance of unity and rationality, technoscientific objectification entails far more ambivalence and insecurity, in which closures are performed not by following the rules of scientific method but instead by intuition, symbolic exchange and political association (18). Transpiring from the above examples in scientific visualization and information visualization is the evidence that visualizing viral substances involves the intervention of cultural and aesthetic choices. The images produced are not just a reflection of the filtering process of the technologies and the instruments used, but also a product of natural, technological and cultural projections. In both cases, the substances to be visualized have to undergo a process of technological translation in order to be turned into visible objects. In addition, any process of visual representation of biological and computer viruses involves the concerted intervention of "several actors" (the scientist analyzing and interpreting the elements captured by the microscope or the data produced by the disassembler, the programmer building custom software and preparing data for the visualization, the graphic designer building the model, the professional reading the final image), "technological devices" (microscopes, computer software, programming language), and "normative settings" (the resemblance between computer and biological viruses) (29)." Finally, the practice of capturing viruses as agglomerate of data as well as their reconstruction based on processed information are source of major debates and confusions between the disciplines of scientific and information visualization. In fact, because of the size and nature of the object visualized, the reliance on data, and because the use of computer-generated techniques to process such data are necessary in the visual construction of both biological and computer viruses, the two disciplines tend to converge. As a result of the relative novelty of computer-generated visualization,  its principles are still the subject of lengthy discussions. No strict regulations have been established on how viruses should be represented. On the one hand, the room for arbitrariness (as well as creative elaboration) potentially increases, leaving room for a great deal of experimentations. This tendency is compatible with the drive to see farther, or, to use the metaphor used at the beginning of this paper, to "move the frontier of the unknown." On the other hand, the lack of strict rules generates some confusions and debates between disciplines. Information visualization pictures non-physical information or data that has no clear mapping to the physical world like stock prices or project tasks, while scientific visualization pertains to the rendering of data that have a natural or original physical form (Chen 2005). However, the definition of the latter is open to some ambiguities. The Georgia Tech Scientific Visualization lab, for example, defines scientific visualization, or SciVis, in a broader sense as the "representation of data graphically as a means of gaining understanding and insight into the data (Georgia Tech 2008, online tutorial on scientific visualization)." This description potentially expands the range of operation of this field to data that don't necessarily have a physical referent. As a result, there is currently no clear consensus on the boundaries between the fields of scientific visualization and information visualization. Scholars often use the two terms interchangeably or they use the first as an umbrella term that contains the second (Chen 2005). In addition, the increasing reliance of research upon a number of technological devices that mainly return data upon request, make the two fields even more blurred. Attempts to reproduce and visualize viruses further amplify this problem. As the submicroscopic size and the immateriality of viruses forces scientists and technologists alike to work mainly with secondary data, the attempts to visualize and to “imagine” viruses raise issues about the disciplines involved in picturing them and about the rules that regulate the disciplines themselves. Because the material to be manipulated for the actual visualization has to consist of data, and because of the iconographic tradition governing the depiction of viruses (biological or otherwise), the images produced by the two disciplines often echo each other. The ambiguity that governs the two fields emerges from the images on display. The lack of clear directions on how we ought to represent viruses, Chen suggests, combined with the variety that dominates the fields, is reflected in the production of pictures where, on the one hand, the recognition of a virus is immediate, thanks to “hints” that anchor the object display to the general concept of virus. On the other hand, such identification is partial for a non-expert audience and often confusing for the expert, who is forced to constantly re-think and reassess his/her competence in interpreting the image. This confirms the inherent value of viruses as undetermined agents, as entities that embody the unknown. The race to delimit and clearly delineate viruses through visualization reiterates a drive to move away the horizon of the unknown as well as a need to exorcize it. The technologies used to produce visual representations of viruses simultaneously approach and withdraw from the virus-turned-object. 3D science. 2007Available from http://www.3dscience.com/Company_Info.php. IDA-pro. 2008]. Available from http://www.hex-rays.com/idapro/. Abrams, Randy. 2006. Everything you wanted to know about computer viruses....MALWARE... but you were afraid you might get infected if you asked . Nercomp Northeast regional computing programs. Axelsson, Stefan, and David Sands. 2006. 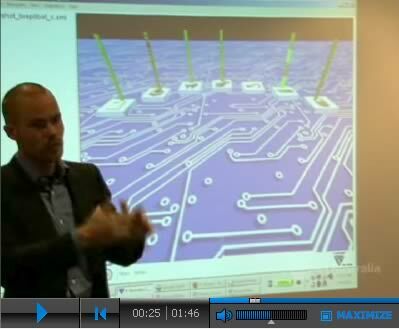 Understanding intrusion detection through visualization. Advances in information security. Vol. 24. New York: Springer. Bauman, Zygmunt. 2006. Liquid fear. Cambridge ; Malden, Mass. : Polity Press. Bear, Greg. 1986. Blood music. New York: Ace Books. Card, Stuart K. 1999. Readings in information visualization : Using vision to think, eds. Jock D. Mackinlay, Ben Shneiderman. San Francisco, Calif.: Morgan Kaufmann Publishers. Carrera, Ero, and Gergely Erdélyi. 2004. Digital genome mapping: Advanced binary malware analysis. Paper presented at Virus Bulletin Conference, Chicago Il, 29 Sept. Oct. 1. Chen, Chaomei 2005. Top 10 unsolved information visualization problems. IEEE Computer Graphics and Applications 25, (4) (July 2005): 12-6. Chen, Chaomei 2004. Information visualization : Beyond the horizon. New York: Springer. Coy, Peter. 1996. 10/28/96 andersen consulting: Data visualization: The final frontier? Businnesweek. Ero. October 24, 2004. Graphing malware. Sean. 2007 July 5. FSCSI and Visualization Tools. http://www.f-secure.com/weblog/archives/00001225.html. Galloway, Alexander R. 2007. The exploit : A theory of networks, ed. Eugene Thacker. Minneapolis: University of Minnesota Press. Gergo. 2005 sept 23. A different look at bagle. http://www.f-secure.com/weblog/archives/archive-092005.html#00000662 ed. ICTVdb. 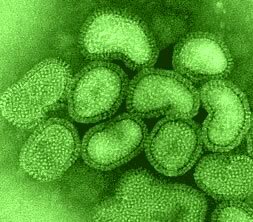 Influenza C virus. 2008]. Available from http://www.ncbi.nlm.nih.gov/ICTVdb/ICTVdB/00.046.0.02.htm. In-Vsee. Interactive nano-visualization in science and engineering in education. 2008. Kaspersky, Eugene. The contemporary antivirus industry and its problems. Available from http://www.kaspersky.com/eugenearticle (accessed 4/22/2008). Latour, Bruno 1983. Give me a laboratory and I will raise the world. In The science studies reader., ed. M. Biagioli, 258-275. New York: Routledge. Lynch, Michael 2006. Discipline and the material form of images : An analysis of scientific visibility. In Visual cultures of science : Rethinking representational practices in knowledge building and science communication., ed. L. Pauwels, 195-221. Hanover, NH: Dartmouth College Press. Pasveer, Bernicke. 2006. Representing or mediating : A history and philosophy of X-ray images in medicine. In Visual cultures of science : Rethinking representational practices in knowledge building and science communication., ed. L. Pauwels, 41-62. Hanover, NH: Dartmouth College Press. Pauwels, Luc 2006. A theoretical framework for assessing visual representational practices in knowledge building and science communications. In Visual cultures of science : Rethinking representational practices in knowledge building and science communication., ed. L. Pauwels, 1-25. Hanover, NH: Dartmouth College Press. Robins, Kevin. 1996. Into the image : Culture and politics in the field of vision. London ; New York: Routledge. Scientific visualization laboratory. What is scientific visualization? 2008. Available from http://www.cc.gatech.edu/scivis/tutorial/linked/whatisscivis.html. Siggraph. History of visualization. 2008. Available from http://www.siggraph.org/education/materials/HyperVis/visgoals/visgoal3.htm. Stafford, Barbara Maria. 1996. Good looking : Essays on the virtue of images. Cambridge, Mass. : The MIT Press. Stephenson, Neal. 1993. Snow crash. A bantam spectra book. Bantam paperback ed. New York: Bantam Books. Trumbo, Jean. 2006. Making science visible : Visual literacy in science communication. In Visual cultures of science : Rethinking representational practices in knowledge building and science communication., ed. L. Pauwels, 226-284. Hanover, NH: Dartmouth College Press. van Loon, Joost. 2002. A contagious living fluid. objectification and assemblage in the history of virology. Theory, Culture and Society 19, (5/6): 107-24. Virilio, P. 2000. The information bomb. New York: Verso. Wagner, Edward K., and Martinez J. Hewlett. 2004. Basic virology. 2nd ed. Malden, MA: Blackwell Science.